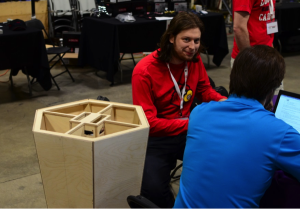 Recently ShopBot helped sponsor an event called the FirstBuild Mega Hackathon in Louisville, KY. I had the pleasure of representing ShopBot and getting to know a lot of innovative thinkers. 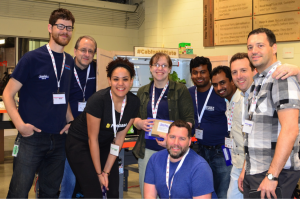 FirstBuild is a makerspace sponsored by GE appliances. 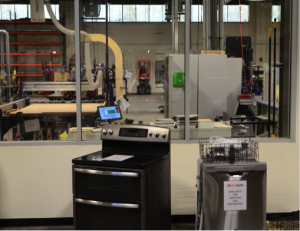 They have a team of engineers, fabricators, and marketers on hand whose mission is to create rapid innovation in the home appliance industry. Their building is located and shared by Louisville University, and allows students to gain experience proposing and developing ideas. 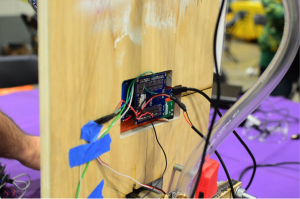 Recently, FirstBuild organized an event called the Mega Hackathon. They brought together a wide variety of sponsors from electronics, appliance, and tool making fields to encourage innovation. Over 200 engineers, hackers, makers, and designers gathered to create and prototype ideas in one long 30 hour session. ShopBot was one of the sponsors and had several tools on hand including a PRSalpha 96-60 ATC, a Desktop, and a Handibot for demonstration and fabrication. I was on site to promote ShopBot, advise teams on design options, and help produce part requests. FirstBuild has a PRSalpha 96-60 ATC (Automatic Tool Changer) tool onsite as one of many advanced technology tools. 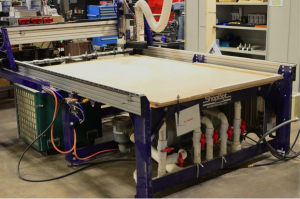 I’d helped install the tool as part of ShopBot’s Production Support program, and it was good to be back on site and visit with users after it was operational. 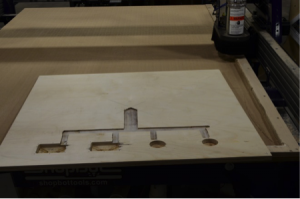 The ShopBot is reported to be one of the busiest tools in the shop, and users were happy to show me projects they’d cut and let me know about their experiences with the tool. 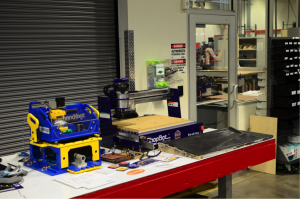 The primary technician using the ShopBot, named Jeremy, had a few operational questions and asked for help with setting up some additional tool holders they had purchased. I spent the afternoon before the Hackathon tuning up the tool, making sure all pinions and motors were optimally adjusted. The ShopBot Docs Maintenance section has some helpful resources if you need to tune up your own tool. 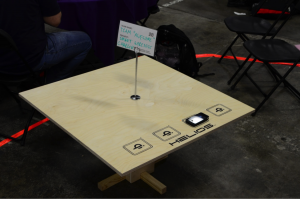 Once the tune up was completed, I began setting up the ShopBot demo table for the Hackathon. We shipped a Handibot with a 4th axis attachment in advance for demo and production. I was happy to find that a local maker space called Maker Mobile had provided a Desktop for use as well. 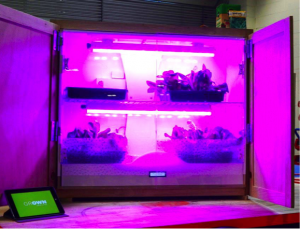 Maker Mobile is a volunteer organization with a 36 foot trailer that visits schools and events in the eastern Kentucky and southern Indiana regions. I also met the Louisville University karting team who had used the ShopBot to create mold parts for all of their carbon fiber panels. They provided a mold and a panel for demonstration of the tool’s 3D capabilities. The Handibot and Desktop stand ready for action. Louisville University karting team’s panel and mold are also on the table. The PRSalpha ATC can be seen beyond the door in the fabrication area. Sponsors were given two minutes to introduce their products and prizes using a PowerPoint presentation. An Onsrud 8 piece bit kit was offered to the team with the most innovative use of the ShopBot or Handibot. Teams self-selected using a system of stickers that identified interests and aptitudes including hackers, makers, programmers, designers, and engineers. Teams could create their own ideas or choose from many ideas generated in the lead up to the event. Appliances await destruction and hacking. The ShopBot PRSalpha ATC can be seen behind them. Several teams initially requested ShopBot help, with more coming as time went on. FirstBuild staff had several knowledgeable fabricators on hand to help with production. 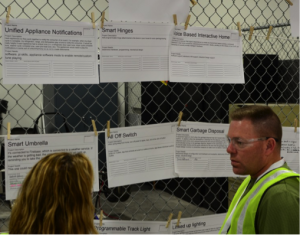 Participants created DXF or STP files for the parts they needed. Once provided a design file, I demonstrated the CAM process and sent the part for cutting. 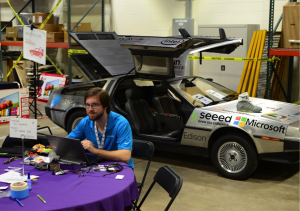 Team SexyBuild had a sweet spot next to the Hackster DeLorean. They made a humidity sensing umbrella stand cut using the ShopBot PRSalpha ATC. 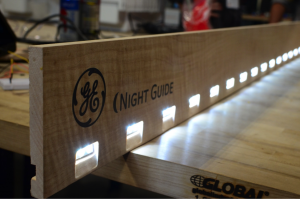 Team LightTrack designed a bathroom door sill that senses your presence at night and provides soft illumination without interrupting others sleep. I overheard the team discussing elaborate steps they’d need to produce their desired shape with the production team. When I suggested that the ShopBot could easily do it all, lightbulbs went on over everyone’s head. 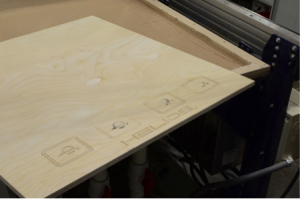 This team made a table using inlayed QI inductive chargers and two-sided machining operations using the ShopBot. This programmable shower faucet has automatic temperature settings for a variety of users. 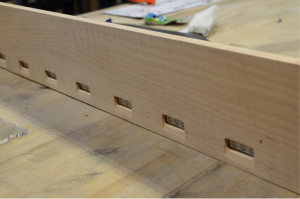 The slots and an inlay pocket were cut using the ShopBot. After hours of work, little sleep, and plenty of caffeine, the teams presented their projects to sponsors and judges. Many interesting projects were produced with prizes up to $5000 being awarded. The system used a variety of ShopBot cut parts including wood and acrylic.